Dr. Jones' Ultimate Feline Health Formula is a Complete, All-Natural Nutritional Health Supplement for cats. The formula is in powder format, and each jar contains 30 doses (one month's supply - 84 grams). Save even more! Order on our Trial Auto-ship Plan and save an additional 15% now! Simply choose your renewal schedule from the 'Subscription type' drop-down box below. You can cancel or change your plan to a different schedule at any time from your account or by contacting support. For no auto-ship, leave Subscription term as 'No subscription'. Only 1 jar at the Trial pricing per household. If you are looking for additional jars, please order here. Dr. Jones' Ultimate Feline Health Formula is a Complete, All-Natural Nutritional Health Supplement for cats. 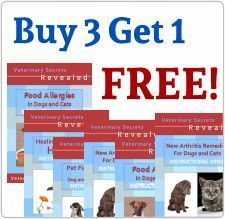 Order our Ultimate Feline Trial for 39% OFF the Regular Price (or choose an Auto-ship Plan and save 50% NOW!). Your Trial jar Comes with a 100% 60-Day Money Back Guarantee. If in the unlikely event you find that Ultimate Feline doesn't work for you or your pets, simply return it for a 100% Refund - including shipping fees.See our full guarantee here. Dr. Jones' Ultimate Feline Health Formula is a powder, and the regular jar contains 30 doses (one month's supply - 84 grams). Our Ultimate Feline Trial plan is for the purpose of trying Ultimate Feline out with your own cat(s), to see if it will work for them and you - and it is available at absolutely NO risk to you! It is covered by our 60-Day, 100% Money Back Guarantee - if you (or your cat) are unsatisfied in any way, simply return the jar and we'll provide a complete refund, including shipping fees. See our full Guarantee here. Only 1 jar of Ultimate Feline is permitted per household at the Trial pricing. There are no fillers or extra ingredients in Dr. Jones' Ultimate Feline Health Formula. There are no artificial colors, flavors, or preservatives. The supplement is naturally preserved with Vitamin E.